"Those who have volunteered to prepare for graduate reunions, University anniversaries, the 'UWATCH' Theatre collection, historical articles for Uniview, and the on-going gathering for a Chronicle of Convocation, have benefited from Maria's knowledge of the photographic holdings, attention to detail and her obliging and friendly attitude,” Convocation’s Deputy Warden Dr Joan Pope said in reading the citation. "Many members of Convocation Council have valued her willing and rapid response to enquiries for accurate, well-sourced information." 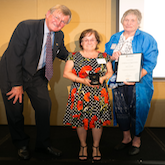 "Maria has been an invaluable source of historical information for Convocation over her years at UWA and we are so grateful for the wonderful service she has given us, and the entire UWA community," Dr McGhie remarked. 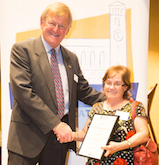 "I am pleased we have been able to acknowledge her wonderful service to UWA by awarding her the Convocation Medal." For UWA's centenary in 2013, she contributed to several publications, created an archives online exhibition, and researched and provided a wide range of material for the designer of Luminous Night, which transformed the Crawley campus into a walk-through phantasmagorical history of UWA.